Let one of our trained skippers take you out to experience the thrills of the Solent, aboard one of our high speed ribs in an exclusive private charter for you and your friends to enjoy ( maximum of 10 people ). Whether it's a high speed thrill or a peaceful session enjoying the sights, then our private charters are perfect. We run a number of different charters, and if you do not see what you are after here, give us a call to discuss your requirements . Come and jump aboard one of our high speed ribs where you will feel the wind rushing through your hair and your heart racing. 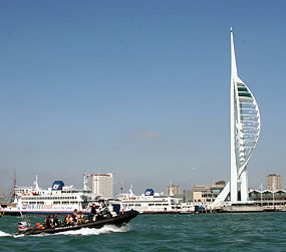 Our rib blast trips take you out in the Solent to enjoy a taste of life on the water. Here we take you out to experience all the thrills the Solent has to offer. After a full safety briefing and run through of the boat, we will leave our base at Old Portsmouth and head out into the harbour. Taking in the warships of old and new, our knowledgeable crew will talk you through these magnificient ships. Passing the ferries as they enter the Port we will then head out into the Solent. We may pass the hovercraft as we head towards the famous historic forts. Then its on towards the Isle Of Wight cruising the beautiful coastline. Depending on the length of your charter we may stop over at Cowes or head further up the Medina river to the Folly Inn for some lunch. On the longer days we will head further on to Yarmouth and the famous Needles. With all our private charters just let us know what you would like to see. All our craft are fully insured and coded. Our knowledgable and professional skippers will helm our boats ensuring the best possible day out and service to you. We can truly offer a one off experience for you to enjoy on your last few days of freedom. Call to discuss your requirements.